Back in April of this year, Yale University released a ground breaking study on Sugar Addiction. What did the study conclude? That yes, one can in fact be addicted to sugar. Ashley Gearhardt, is a clinical psychology doctoral student from the Yale & Rudd Center for Policy and Obesity. She suggests that an addiction to sugar is quite similar to an addiction to cocaine. On the cusp of Yale’s study, Toronto’s York University released similar findings. Two major universities may have just confirmed what many of us already know, that when we eat sugar… we just can’t stop. The producers of ABC’s Nigthline and Cynthia McFadden took notice, and of course they had some questions. Shades of Hope was honored to host the producers of Nightline and Mrs. McFadden as they respectfully documented a group of our Six Day Intensive clients. The Six Day Intensive is a phenomenal week of inner exploration and realization into one’s core issues. The majority of clients who attend the Six Day are seeking treatment for their eating disorders, many of them being sugar addicts. The producers hung on every detail as the group came together, shared their stories and let go the illusion of control. 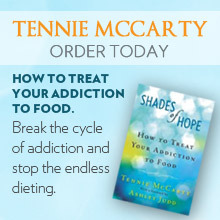 On Wednesday, September 7th, Tennie McCarty, CEO and co-founder of Shades of Hope, will share her personal story and take you ‘behind the scenes’ into the treatment of eating disorders and the deadly disease of addiction.